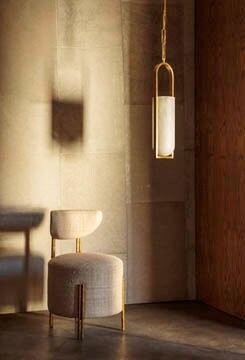 Arm Height: 23", Inside Width: 22", Arm Width: 4"
Seat Height: 19", Sitting Depth: 23"
The Bijoux Chair, features a tight upholstered seat and back, with an upright but comfortable seating position, married to a lustrous and architectural burnished brass base. The thin back and upward sweeping shelter style arms along with the soft waterfall curve of the seat lend this chair a fresh, modern vibe. Featuring 8-way hand tied springs our engineered hardwood frames rely on mortise-and-tenon joinery, setting the standard for quality and craftsmanship. Available in a selection of curated fabrics and leathers.